An appealing and practical feature for your garden, these machined LogLap planters comes with an interesting design to showcase your favourite plants or grow fruit and vegetables in. With a stylish appeal, it features FSC timber in an impressive splinter-free rounded design. Planting over 2, 3 or even 4 levels, you can create an efficient garden environment on your patio, balcony and all hard-covered areas to provide a growing space that warms up faster than surrounding soil thereby enabling earlier sowings. They do exactly what they say they do and simply slot-together - no tools required! 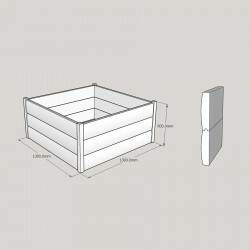 Ideal for smaller spaces in gardens or allotments, these easy-to-fix Slot-Together Raised Bed Kits allow you to grow and harvest your own fruit, vegetables or herbs. 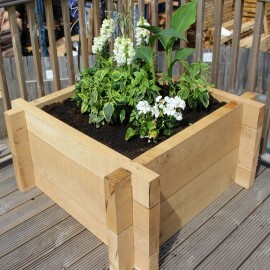 Cut by us straight from the tree, each raised bed kit regardless of whether you choose the oak or softwood option are highly unique, full of character, solid and durable. The sleepers will have pieces cut out so they can be quickly fixed together to form the raised bed without the need for fixings. Attractive and practical, these planed all round FlowerBed planters are a splendid way to showcase your plants. 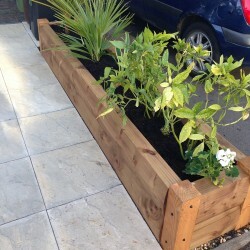 With a stylish appeal, it features FSC timber in a simple easy to assemble design. Planting over 2, 3 or even 4 levels, you can create an efficient garden environment on your patio, balcony and all hard-covered areas to provide a growing space that warms up faster than surrounding soil thereby enabling earlier sowings. As with our standard brown loglap planters, these machined half LogLap planters come with an interesting design to showcase your favourite plants or grow fruit and vegetables in. With a stylish appeal, it features FSC timber in an impressive splinter-free rounded design. Planting over 2, 3 or even 4 levels, you can create an efficient garden environment on your patio, balcony and all hard-covered areas to provide a growing space that warms up faster than surrounding soil thereby enabling earlier sowings. 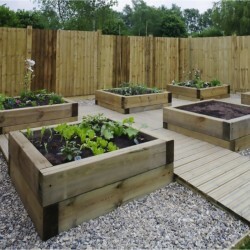 A wonderful garden feature that is perfect for any area that needs brightening up, these great raised beds are easily assembled and have been pressure treated to protect against rot, which means that they will keep their look and quality for years to come.